Trans Fats Alternatives Handbook from C.H.I.P.S. On January 1, 2006, the U.S. Food and Drug Administration required the mandatory declaration of the amount of trans fat present in foods. 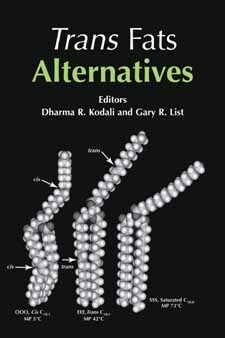 Trans Fats Alternatives is an indispensable guide for everyone who is interested in trans fats�from food product manufacturers who provide the trans fat solutions to the researchers who would like to create innovative solutions. With contributions from major fats and oils suppliers, including Aarhus, ADM, Bunge, Cargill, Loders Croklaan, and Premium Vegetable Oils, Trans Fats Alternatives provides cutting-edge research and insights into a major industry issue. Trans Fat Reformulation Is Not a Technical Objective!